Duncan Regehr is a prolific figurative painter whose enormous body of work is profoundly and distinctly poetic. His recent work revolves around images suggested to the artist through his relationships, his dreams and his many interests. Reaching into the depths of psychology and the unconscious, Regehr’s paintings convey his penetrating observations of humanity and the evolution of his social consciousness. 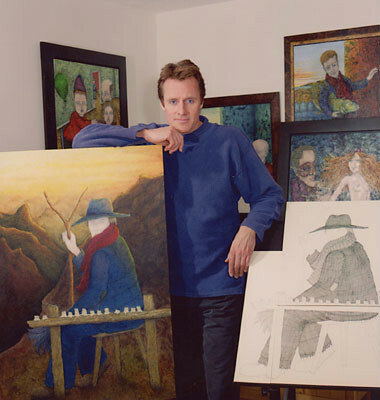 Duncan Regehr is a multi-talented individual who has been recognized for his work in several mediums. An accomplished painter, he has had solo exhibitions in galleries in the United States, Canada and Europe. His writing has included numerous journals and articles. His book “Dragon’s Eye,” a fascinating automonograph, includes many examples of his insightful poetry and 169 color illustrations of his art. His varied roles on television, film, radio and in the theater have been memorable, captivating audiences with his wonderful characterizations. Duncan Regehr’s documentation took place in 2000. The FOTM Archive contains extensive information about this artist.